It’s 2015 – How Are You Communicating in Your Community? 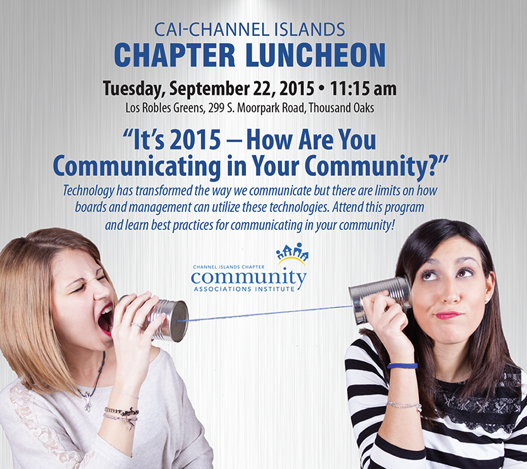 Join SwedelsonGottlieb Senior Partner David Swedelson, co-presenter Karen Kokowicz of Coro Community Management & Consulting and the Channel Islands Chapter of Community Associations Institute on September 22, 2015, and learn how to communicate better in your association. Follow this link to register for this event. – Are board member email discussions off limits? What constitutes an emergency? Can vendor issues be discussed? – How to handle the board member who refuses to stop doing board business by email. – How to respond to inappropriate emails, mass emails from homeowners and web postings. – Is board member voting by email allowed? What about taking the vote of the owners via an online service? – Can Association documents and required disclosures be distributed using new technology? – What are the legal risks and pitfalls of using NextDoor, chat rooms, social media and more? – And learn the best methods to effectively communicate with your owners.